Every hedgehog has its own personality. While most are pretty social, some people will come across some hedgehogs which are harder to manage. The following videos will help you with handling and socializing your hedgehog. If anyone has any questions, please feel free to email me. If you have a tame hedgie, picking it up will be a breeze. Just scoop it from underneath. If your hedgehog is timid, gently slide your fingers underneath the hedgie from both sides and slowly scoop it onto your hands. Until you are used to your hedgie, you can put on gloves or use a blanket to scoop it up. Keep your hands flat so the hedgie doesn't curl up around your hand. This will allow a better surface for the hedgie to unwind to as well. To get your hedgie to unwind, tilt his face forward and gravity will do the job. They will slowly release their hold . You can also slowly move the hedgie from one hand to another to get him to start moving. Depending on the hedgehog, some will start moving around right away, while others need to do it on their own terms. Be patient. It will happen. As they unwind slowly allow them to walk around you, or over you so they get comfortable with your scent. Once the are more adventurous and start to explore, place your hand in front of them so they walk to it and smell it. It's simple "friendly scent" bonding. When your hedgehog looks comfortable, pet it around the face. Approach your hedgehog from the front so they don't get spooked. Pet its forehead, and around the cheeks, under the chin. The more you pet their face the less they will hide it and get spooked to things moving around them. Repeating these steps will make a big difference in just a few days. With a little bit of patience your hedgehog can become easy to handle. When they huff and puff, do not get discouraged and think they don't like you. This is how they talk. Over time you will learn what each huff means. If you put down your hedgehog every time it huffs , it will learn to use it against you. 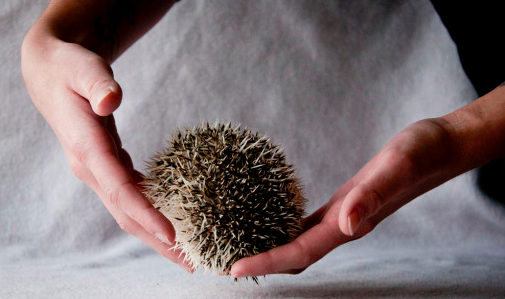 For baby hedgehogs, the more you play with them, the friendlier they get. Once you tame your hedgehog, they stay that way. WHY DO HEDGEHOGS HUFF AND PUFF? ​Since Hedgehogs in the wild are ground dwelling animals and are often preyed upon, they have strong instincts for protection. While taming and bonding with your hedgehog it is important to realize that instincts will often override any learned behavioUr. The quicker you calm their instinctual triggers the quicker your hedgehog will tame and bond with you. Understanding what your hedgehog is trying to tell you will help you teach your hedgehog that you are not going to eat him! Hedgehogs have a papilla located behind the incisors and ducts which connect the oral cavity to the vomeronasal organ, a chemosensory organ located between the roof of the mouth and the palate. So, to get a better whiff of something you will see hedgehog sniffing and displaying their two front teeth. This behavior is called the flehmen response. Hedgehogs really get to know their world by their sense of taste and smell! Keep this in mind when you bring your hedgehog home. A new home can be a time of sensory overload for a hedgehog. Be patient with your new hedgehog and let it explore. The more your hedgehog has been exposed to the scents and tastes, the quicker it will settle in and start to trust you. Many things will trigger your hedgehog’s instincts to take cover and pull their visor quills (the quills located on the forehead between their ears) over their face. Shadows overhead can look like a predator. Noises can startle a hedgehog. Sometimes just being uncertain of a new person can make a hedgehog start a game of peek-a- boo! Be patient, quiet and move slowly until your hedgehog becomes comfortable with you. When your hedgehog’s quills are lying flat and freely move with your hand (it feels like petting a broom rather than a pin cushion), your hedgehog is in a relaxed state. Positive reinforcement like offering a treat during this time can influence the bond between you and your hedgehog. You should note that some babies won’t have completely flat quills until their adult quills come in. Most hedgehogs don’t like you reaching into their cage. When you remove the igloo or hiding spot from your hedgehog, you trigger its defensive instincts. Hedgehogs only have rods on their retinas for seeing light or dark. Overstimulation of these neurons by the light blinds and frightens your hedgehog. It’s kind of like when you are asleep and someone flips on the light in the middle of the night. It takes a few seconds for your eyes to adjust. Now imagine a sleeping hedgehog being exposed when the hiding space is lifted and can’t see what is coming! It is only natural for your hedgehog to roll right up in a ball, give a huff and try to poke you with its quills. No matter how social your hedgehog is, sometimes this instinctual behavior never goes away. 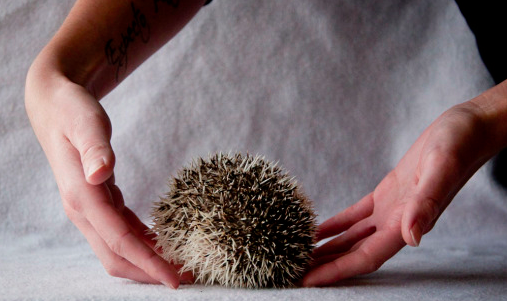 Tickling or petting the quills can trigger your hedgehog to roll into a ball or defensive position. Until the hedgehog is used to you, avoid touching the quills lightly to cause the tickle effect. Remember, we don’t want to trigger the hedgehog’s instincts by looking like a predator. Gripping your hedgehog with closed hands or keeping it close to your body mimics being captured by a predator. If handled carefully your hedgehog will learn you are safe and let you hold it close to your body. To pick up your hedgehog gently scoop him up by tucking your hands underneath and from the sides. Next, you will want to keep your hands flat (or flat-ish) and away from your body. Hedgehogs have a great sense of smell so it is important to get the hedgehog used to your scent. One way to get a hedgehog used to your sent is to sleep in a t-shirt for several nights or wear one all day (without washing it) then drape the t-shirt over the hedgehog’s cage. Hedgehogs are very sensitive to sound in that most ball up or prickle when they hear new or loud noises. Talk to your hedgehog and let it get to know your voice. Talking to your hedgehog while holding, snuggling, bathing, and other enjoyable activities will help your hedgehog associate the sound of your voice with comfort and enjoyment. Over the years we have found the radio and music very soothing for a variety of different animals. Hedgehogs are no exception. One of the best and easiest ways to bond with your hedgehog is to simply hold your hedgehog on your lap for an hour or so while watching television or a movie. Don’t attempt to pet a shy hedgehog simply relax and come out on its own, walk around, explore. Most of the time your hedgehog will uncurl and attempt to explore in just a few minutes. Other hedgehogs may take a little longer to begin to relax but please be patient and allow it to explore on its own terms. Let if huff it’s little brain out if it has to. Holding your hedgie on your chest so your hedgehog can feel your body heat and hear your heartbeat. Hold him while watching t.v. or long enough so that he sleeps on you, as having your hedgie sleep on you is an excellent way to get them to bond. Allow it to crawl over you if active..
put on a t-shirt with a nice big over shirt on and tuck the hedgehog in-between the layers. You can also sit your hedgehog down on the floor in a hedgie safe room (bathrooms are great) or area. Don’t attempt to touch your hedgie but instead allow it to get to know you on its own terms. Place your hand several inches away from your hedgehog and allow it to come up to your hands and smell you. Your hedgehog is relaxed when its quills are laid down and it is moving about without flinching every time you move. Certain sounds may still scare a relaxed hedgehog. You can try to offer hedgies treats from your hand. Your hedgehog may respond well it might completely ignore you. Don’t let your hedgie lick your fingers or hand because it might decide that since a little bit of you tastes good a lot of you might taste better!! Bathing your hedgehog or allowing it to play in water. They won't ball up in the water and it will get him used to you touching him. 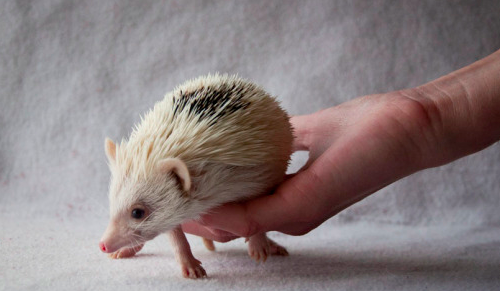 Anytime you buy a hedgehog from a private breeder, you are taking home a hand tamed baby, it will need a few days to adjust to the new owners smell. It is your responsibility as the new owner to work with your hedgehog and keep it tame. If you are afraid of him/her, he/she will sense that. If you never handle him/her, he/she will not remain tame. If you put it down every time it huffs and puffs, that’s what it will learn. It is up to you to keep working with him/her! If you are purchasing an adult hedgehog from a breeder or a rescue- please have some patience with him or her. All adults are being adopted out for one reason or another, whether their first family was no longer able to care for him/her, or it was a retired breeder, or whatever the situation may be, all adults have the ability to become better pets provided that you give him/her the time they need to adjust. The more you handle them, the better pet they will be as well. With adults, they may huff and puff, the may click and pop, the best way to calm an upset hedgehog is to gently rock them for a very short period of time. 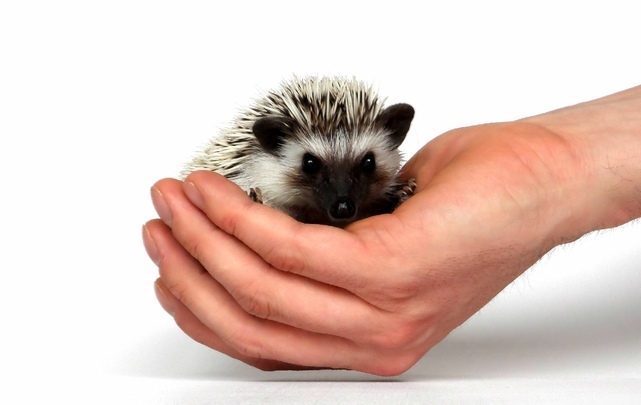 Try holding the hedgehog in a Snuggle Sack on your lap for them to get more use to your voice and your scent. Within a week, most adult hedgehogs should warm up. Some may take longer than others, but the key is patience and time! You need to be patient, and spend lots of time with them. Try offering treats from the palm of your hand, rub the quills on the very far backside of your hedgehog, allow him or her to cuddle in your arms or on your lap. The more safe they feel, the more comfortable they will be with you.